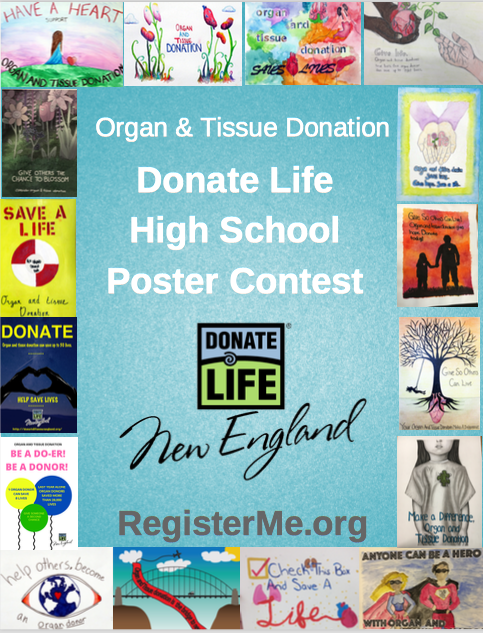 The Donate Life Maine Poster Contest is open to all Maine high school students in grades 9-12. Students are invited to create a poster about organ and tissue donation awareness. Artwork must be original. No copyrighted or trademarked artwork will be accepted for judging with the exception of the Donate Life logo. Your entry must include positive and accurate messaging about organ and tissue donation and include the phrase “organ and tissue donation”. Entry must be at least 8.5×11” and no larger than 18×24”. Leave a 1” border around your poster, no writing, image or drawing within 1” of the edges. Your entry must not have grammatical or spelling errors. Your entry must have a completed entry form attached to your poster (must be legible). Use materials that can be easily reproduced, such as paint, pencil, ink, charcoal, pastels, graphic design and photography. Do not fold, matte, laminate or frame. Posters must be submitted and received by March 1, 2019. E-mail graphic design entries to volunteerservices@neds.org and include the entry form information. Winners will be selected by a panel of judges based on criteria of originality, artistic merit and effective use of theme. Teacher with the most art submissions will receive a $100 Amazon Gift Card for classroom materials. Teachers and/or students reach out to the volunteer services at volunteerservices@neds.org or Jennifer_Cray@neds.org with any questions they may have.